heather kojan quilts: 100 Blocks Blog Tour and Giveaway! Yeah!!! 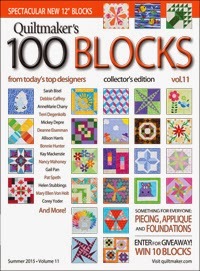 It's Blog Tour time and my giveaway day for Volume 11 of Quiltmaker's 100 Blocks!! If this is your first time here, Hi! I'm Heather. I've been quilting for over 25 years. I'm the founder of the Baltimore Modern Quilt Guild. I teach and lecture in and around Baltimore, MD/PA/DE and Virginia as well as with the Original Sewing and Quilt Expo. I'm also a contributing author to Classic Modern Quilts. Thanks for stopping by! Oh, hey, there's my block on the cover! Left side, second one down! For this one, I stayed with what I like: scrap quilts, improv quilts, string quilts. The block components are simple, and can be changed up in lots of ways. And here are some other ways to assemble the block. So versatile! How about that giveaway? Would you like to win your own copy? Just leave me a comment below. Now that the warm weather is finally here, let me know what your favorite summer beverage is. (Mine is green tea lemonade: brew 8-10 green tea bags in about 2 cups of water. Add to a 2 quart pitcher. Add one sleeve of crystal light lemonade mix. Top with water and ice to fill pitcher. Delish!) For an extra chance to win, follow me on instagram. I'm @heatherkojan. Then come back and leave another comment letting me know you're a follower! Oh, and make sure I have a way to reach you, too! I just followed you on IG. We enjoy green tea as well. We mix a packet of Crystal Light's peach tea in ours. I like Iced Tea with fresh mint. Great block. My favorite drink is ice water! I love these blocks. What a great book! I love lemonade in the summertime! Great block, I will try it! My favorite drink is always Diet Coke! Congrats on your block! Unsweetened iced tea is my go-to summer drink. I follow on instagram as @queencitymama89. Love your block Heather, especially that you can create different designs with it. My favorite beverage year round is ice cold water! My favorite summer beverage is ice-cold water. That's a really cute block! I make sun tea all year round. Congratulations on your block Heather. It would be a good block to hand quilt: no curves! Congrats covergirl! Strings and scraps, great combo. My go to beverage is lemon water. summer drink? Pink Lemonaide with a slice of lime. Don't know if it is the color, the flavor, or both! Really great block! I love a cold Rivella (it is a real Swiss drink you can buy in shops) and just plain cold water! Hi Heather, This is my first time visiting your blog. I was at QM checking out this month's "Bitty Block" and came across your "Kisses and Hugs" quilt. LOVE! I've also been contemplating starting a modern quilt guild in my area. Do you have any sources to recommend on how to start a guild? As for my favorite summer drink, that would be WATER. Great block! I love the rainbow effect you get when using scraps. I love sweet tea! I'm a new follower on IG as Ceciliaquilts. My favorite beverage is water infused with lemon. But yours sounds delicious, I'll definitely be giving it a try. I love fresh squeezed lemon/limeade. Thanks for sharing and the chance to win. Iced tea and lemonade are my favorites! Congrats on a wonderful block! I can see myself making this block. Thanks for a chance to win a copy of the magazine. Personally, I like Margaritas :D but since that isn't very practical for day to day consumption, there's nothing quite as satisfying as a glass of ice cold water. Your block is so happy, love it. I like raspberry ice tea. Hi Heather, This is my first time looking at your blog. There are so many wonderful ideas, I am going to check here if I want inspiration. Congrats on having your block in the magazine. I esp. like the chevron placement. Ruthie G.
I joined BMQG this year & am loving it! Heather - Are you kidding? That block name is most excellent! Congrats on making the book once again. Well done! My favorite summer drink. Ice water. Love your block. Need to sort my scraps. I like lemonade and drink that the most! You have a wonderful block! Congrats on getting into the magazine! It's great to see so many doable pieced blocks today. I want to try yours using florals. Love the block, Heather. Congratulations! Nothing like a tall glass of lemonade. I love this block! I love paper piecing now that I got into it last year. My favorite summer drink is homemade limeade. I love peach tea. I also love your block. Scrappy quilts are the best! oops - forgot to mention that I don't do instagram - but I'd certainly follow you if I did! My favorite summer drink is sweet tea! I follow you on Instagram(eneuland)! Love the block! I live in the deep south, so warm weather is almost year round. So my favorite beverage is SWEET Iced Tea. Thanks for the amazing block. Congrats on being a cover girl. Thanks for the giveaway! What a very versatile block you have shared with us today. Just love it and it is just so full of color. I love your lemonade recipe. I believe I am gonna make me some and enjoy the rest of the blog tour. Thank you for being a part of the QM's 100 Blocks, Volume 11 blog tour, sharing your block with all of us and the chance to win a copy of this magazine to enjoy with a glass of this wonderful tea lemonade. You have inspired me with your block, now I can used my leftovers of pretty fabric to make your block. I love lemonade. Hot tea for me! Lovely block!!! I love Raspberry lemonade: very refreshing on a hot day! My favorite beverage for summer s water with lemon. You block I awesome! I love half tea, half lemonade. Very refreshing! Can't wait to try your block. So fun! On a hot day, I like lemonade made with ginger and honey. I love lemonade - nice and tart. I love Sangria in the summer. Delish. Thanks for sponsoring the giveaway! Darling block design. My favorite drink is iced tea...no flavor, no sugar, nothing added...just tea. Love your block-there are so many ways to arrange it! Southern sweet tea! Live your block! Love your block in the X shape and in the O shape. Thanks for joining the Quiltmakers 100 Blocks tour. Love your colorful block. As to favorite drink it is just plain old water from the sky as we catch our water from the roof. We live on a island and it has lots of rock and lots of rain! I love your block! Looks very versatile. My favorite summer drink is Long Island Iced Tea. Thanks! Wonderful block and I like how it can be changed around for new looks. I drink watered down orange juice, gives it just enough flavor and lots of water to keep me hydrated. I love citrus green tea during the hot summer months! It reminds me of my feet in the sand at the beach! We freeze them and then sip on them in the sun as the tea thaws!! When it's hot outside I like iced coffee with a bit of chocolate syrup in it. 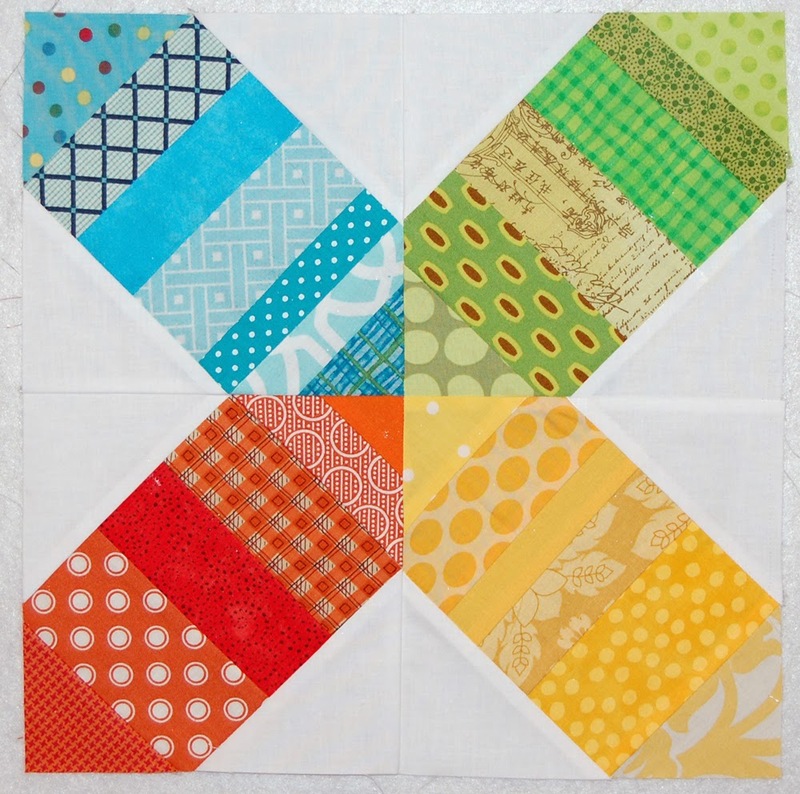 Love your block, scrappy with controlled colors is always a winner with me. Water is my choice. When it gets really hot (100's) and water won't do, then I go to iced tea. I like water with lemon sauce or white wine with water. congrats. this is such a fun block. I love to make my own iced tea. I like it light so when I make it I make it dark so I add water to it. I like to think it last in the fridge a bit longer that way. lol I make a gallon at a time. 2 Lipton tea bags and 3 constant comment tea bags. has a nice light orange flavor. Mix of peach & sweet teas is my choice. Great block! My fav is cold brew iced coffee. hm, maybe I will make a batch today. I already follow you on IG. I just love blocks that let me use up scraps! Great design :o) My favorite summer beverage is iced coffee...yum, yum!! Thanks so much for an opportunity to win a copy of the Volume 11 issue! 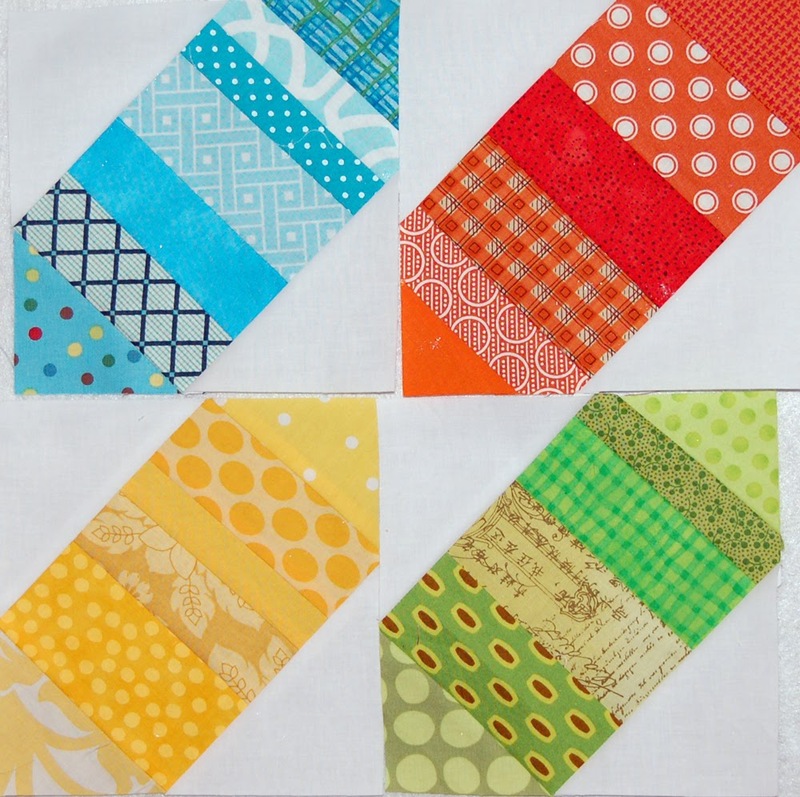 Your block is very summery itself--though, obviously, versatile depending on fabric choices. It could even be used in a signature album quilt. In summer I love sun tea, unsweetened, but occasionally need a fix of Kool Aid Lemonade (half the sugar, though). I LOVE your block. A great way to use up your stash, and so many different possibilities. My favorite summer beverage is ice cold lemonade with mint leaves. Sweet tea is my favorite. Thanks. I love sparkling water with LOTS of ice in summer time. I love water with lemons. Thank you for sharing this super block!!! Can't wait to start sorting my scraps into colors to make an X and O quilt. Thanks again! I'm a new follower on Instagram! 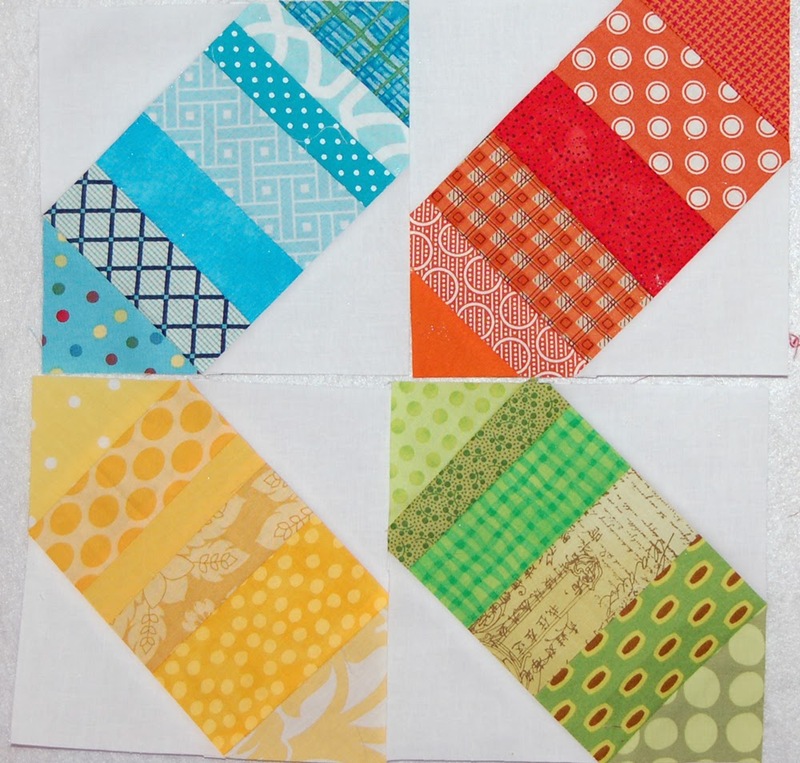 Your block is a great way to use up some scraps and it looks nice in all the versions you have shown. I like nothing better than a glass of ice water on a cold day. My favorite summer drink is lemonade. Love the scrappy block. Cute block. I usually drink just ice water. Peach tea is a favorite of mine. I like that your block is so scrap friendly. It looks super. I drink a variety of teas...hot in the cold weather and iced in the summer. Love your happy block! I'm a water drinker year around. Sometimes I like peach tea. I love your block! My favorite is Peach tea. It comes in a powder mix. Love your block Heather. My favorite drink is a cold glass of good "well" water. Thank you for the chance to win a copy of the magazine. Great scrappy block. My favorite summer drink is lemonade. I am a water person, no ice. I think your block would look great in the zig zag pattern! How fun to be a covergirl! Awesome block too. Mine is Jasmine Tea....so refreshing. My favorite summer beverage is iced tea. I usually use decaffinated black tea, but your green tea lemonade sounds good! I love raspberry iced tea. So gooood. I love honey ginger lemonade. I love your block! I like fruit infused ice water in the summer, but I am also naughty and enjoy a real sugar pepsi once in awhile too. My favorite drink is ice tea, made with black tea, with a dash of lemon juice. Love your block! I have a plastic container full of bright scraps that would work great. My family makes "Easy Party Punch". 2 packets of orange Kool-Aid, a large can of pineapple juice, a quart of water, 1/2 cup of sugar, liter of 7-Up or Sprite (can be diet), and a few scoops of orange sherbet. Delicious! I like to drink sun tea! My favorite drink is water with orange, lemon and raspberries in it. I love it! I'd say ice cold lemonade. Water is my favorite all the time drink. Do love an iced coffee or Frappuccino for a treat. Frozen lemonade is my favorite summertime drink. I have a large abundant lemon tree in the back yard...LOVE fresh squeezed lemonade. Hugs and kisses blocks are great! I love lemonade. Strawberry or raspberry. I'm also very partial to Crystal Light Energy in the Pomegranate Lemonade. 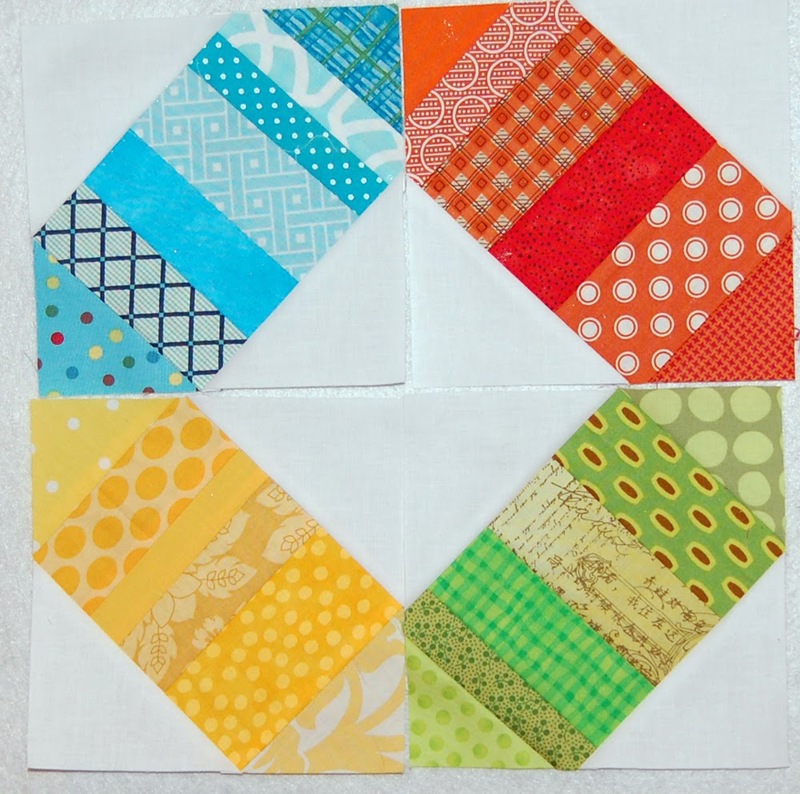 Such a pretty block, so colorful, and easy to use different ways. My favorite beverage is iced tea - plain, brewed, no flavoring, and no sugar. I love raspberry lemonade but your green tea lemonade sounds delicious too. I love your use of bright, cheery colors! Thanks for the chance to win. I forgot to mention - my favorite summertime drink is an ice cold Pepsi in a frosted glass mug. Your block looks very fun. Congrats on being chosen to be in the magazine. My favorite drink is sweet tea. It just quenches the thirst and heat of summer so well. I love the block(s) you created! So much potential for all those little scraps! My favorite summer drink is water... Honestly. LOTS of ice though. Sometimes I put fruit in it, but normally just plain. I love your block! I love seeing new ways to use my scraps! I love a tall glass of ice tea and on those special occasions a nice margarita! I love scrappy, I love strings and I love your block! I just started following you on IG--my favorite beverage is plain iced tea--no sweetener, just a sprinkle of True Lemon or True Lime. My favorite is flavored water, either mango or grapefruit. Unfortunately, I don't do instagram. Just not that much connect to social media. I find it takes away from quilting. But, thanks anyway. Love the versatility of your block. Thanks for the chance to win. Forgot the drink. Passion ice tea, but I would like to try your green tea lemonade. Hi- I'd love to make your block in x's and o's ... in the shape of a heart. My eldest grandson left this in a note to my two granddaughters!So cute! In summer we make sun tea with green tea and fresh mint or with Constant Comment tea. Yum. My favorite summer beverage is sipping a French rose on the back deck. I like ice cold lemonade! I love iced chai tea latte. Your block is fun. Peach iced tea! But I'm gonna try yours too!!! I like lemonade in the summer. Your block is so cute. Love the colors. Raspberry lemonade is my favorite! I am a sweet tea lover year round. Love the block, Heather! Thanks for the giveaway. I am now on Instagram. Thanks for the giveaway. Old fashioned super sweet tea (southern style!) or fresh lemonade! I'm from Texas, so it has to be cold sweet tea! Favorite? Just plain old ice water. Cute block! I like raspberry lemonade in the summer - so refreshing! Iced tea! Boring but good. Going to try this block for sure! and I love the green tea lemonade recipe...thanks for sharing! Very cute block. I love cold ice tea. Thanks. Your block's so cute!! !, my fave drink's Iced tea. Water--we have the best well water! Inspired by your block, another baby qui,t on the horizon.... Enjoyed having you at our meeting last night! I'm a Southern Gal...... Sweet Ice Tea. loved the rocket block. I get your emails and would love to get newsletters too.